Search in Vend Ecommerce – How can we help? Ecommerce search allows your customers to search for the product's and pages on your ecommerce store. Once enabled, your customers will be able to search for products by their title or description or pages by their name or content. There are a number of search options available to you and your customer. These options below can help you and your customer refine their search and find more exact results. You can choose to search for products or pages by searching for a number of keywords together, this will give you back results that contain all of these keywords. To do this, type in all the keywords you wish to search for and click enter. You can also search for products or pages using the OR function. By typing "floral OR dress" you will receive product and page results that contain either "floral" or "dress" but not neccessarily both. For example, searching for this will bring back results such as polka dot dress and floral shorts. Sometimes you may want to fine tune your searches by excluding some keywords. To do this, type in the word you wish to search for followed by a space, then a hyphen and the word you wish to exclude. If, for example, you wanted to search for floral but exclude any results containing the word 'dress', you could decide to search for this: floral -dress. Once you have added search to your store, you may want to know what terms your customers are searching for. 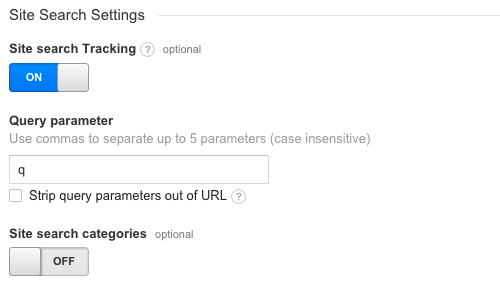 To do this, you'll need to setup site search on your Google Analytics account. If you are yet to setup Google Analytics on your ecommerce store, check out our setup instructions here. To setup site search sign on to your Google Analytics account and follow these steps. Once this is all setup you will be able to see your ecommerce store search queries on your Google Analytics account.